Peel, Bruce. "Emblems of Canada". The Canadian Encyclopedia, 04 March 2015, Historica Canada. https://www.thecanadianencyclopedia.ca/en/article/emblems-of-canada. Accessed 18 April 2019. Emblems of Canada include the national coat of arms and flag. When John Cabot arrived on the shores of North America in 1497, he raised a cross and the royal banner of England. 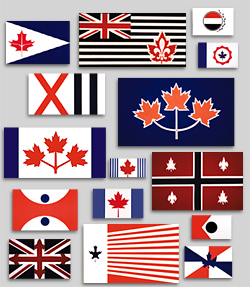 Since then, Canada’s emblems have evolved out of those traditionally used by France and Britain. Flag of Canada (artwork by Karen Bailey). Emblems of Canada include the national coat of arms and flag. When John Cabot arrived on the shores of North America in 1497, he raised a cross and the royal banner of England. Since then, Canada’s emblems have evolved out of those traditionally used by France and Britain. Today they include such national symbols as the beaver and the maple leaf. When John Cabot (Giovanni Caboto) landed on the coast of North America on St John the Baptist Day, 24 June 1497, he formally took possession of the surrounding territory in the name of King Henry VII of England by raising a large cross and the royal banner, which then contained the three gold fleurs-de-lis of France on a blue field and the three gold lions of England on red, both repeated twice. Beginning in 1340, the fleurs-de-lis occupied the most important quarters of both the royal banner and arms (i.e., coat of arms) to express England’s claim to the throne of France. The British continued to display the royal arms at land claims, such as Sir Humphrey Gilbert’s ceremony claiming Newfoundland in 1583. They adorned the seals used in the Canadian colonies and the medals awarded to Aboriginal chiefs by British sovereigns. Some examples of the royal arms have survived in courthouses, post offices and Anglican churches. Like the British use of their arms, the royal arms of France (three gold fleurs-de-lis on blue) were consistently displayed at land claiming ceremonies beginning with Jacques Cartier in 1534. In New France, they were exhibited on city gates, forts and important buildings, including churches and public places. They also appeared on government seals and coins. At Confederation in 1867 no arms were assigned to the new Dominion of Canada. In 1868 the original provinces — Nova Scotia, New Brunswick, Québec and Ontario — received arms by a royal warrant that also provided for a great seal of Canada, a shield bearing the arms of the four provinces. On the great seal assigned to Canada in 1869, the arms of each province appeared separately, two on each side of the figure of Queen Victoria. The four province shield survived and came to be considered the arms of the Dominion. As additional provinces entered Confederation, armorial bearings assigned to them were added to the federal shield, creating an unsatisfactory aggregation. A Canadian committee appointed in 1919 decided within a year on the basic elements of a new design, which was forwarded to the College of Arms in London, England, for its consideration. 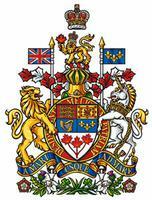 In 1921 King George V, by royal proclamation, assigned armorial bearings for Canada. The design is traditional, with the shield displaying the arms of England, Scotland, Ireland and France to symbolize the nation's founders. Underneath the four quarters, on a white field, is a sprig of three maple leaves to indicate the new nation of many peoples. Originally green, in 1957 the leaves officially became red, a common autumnal colour, and thus in accord with Canada's national colours, red and white. The crest and the shield's supporters are strikingly similar to the royal arms of Great Britain. The motto A Mari Usque ad Mare ("From sea to sea") is from the Bible's Psalm 72:8: "He shall have dominion also from sea to sea, and from the river unto the ends of the earth" (King James Version). In 1994 a ribbon with the motto of the Order of Canada, Desiderantes meliorem patriam ("They desire a better country"), was added to the arms of Canada. The red and white flag featuring a stylized maple leaf was proclaimed Canada's national flag by Queen Elizabeth II in 1965. Its adoption was the culmination of many years of discussion, hundreds of designs and the heated flag debate in Parliament. The proportions of the flag are in a ratio of two to one: two by length and one by width. The white square in the centre is called a “Canadian pale” because it is twice as wide as the usual pale, a heraldic term meaning a vertical band. Before 1965 Canada did not have an official flag. During the French regime the royal banner of France — three gold fleurs-de-lis on a blue field — was flown briefly during the early years of colonization in Canada and the failed colony in Florida in 1564–65. In the first half of the 17th century, Canadians became convinced that the completely white flag of the French Royal Navy, which they saw on ships and forts, was in fact the national flag of France, the flag they owed allegiance to. After the Conquest in 1760 the flags most commonly flown were Great Britain's Union Flag (Union Jack) and the Canadian Red Ensign. The latter was the flag of the British merchant marine, red, with the Union Jack in the canton (i.e., upper portion near the staff). From its forts and canoes, the Hudson’s Bay Company, which governed a large part of what is now Canada, flew the Red Ensign with HBC in the fly (i.e., the portion furthest from the staff). Soon after Confederation, Canadians began flying, on both land and sea, the Red Ensign with the shield of the Dominion in the fly. As the number of arms increased, the shield was difficult to recognize, especially at sea. In 1892, the British Admiralty authorized its use, with the addition of the original four province shield in the fly, on merchant vessels registered in Canada. In 1912, the British secretary of state instructed the governor general that the Union Flag was Canada’s flag to be flown on land. 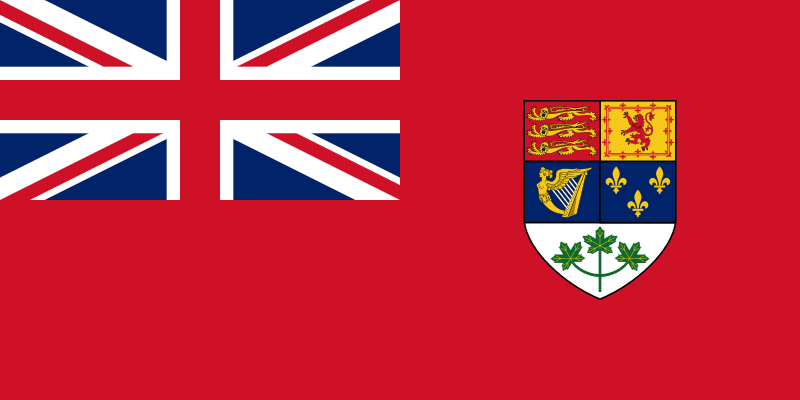 In 1924, a Canadian order-in-council decreed that the Red Ensign with the shield of Canada in the fly could be flown over Canadian government buildings abroad. The Red Ensign was later carried by Canadian athletes at the Olympics and by Canadian troops in the Second World War. 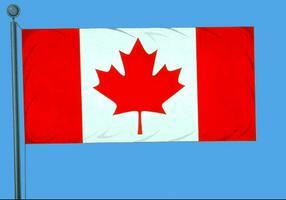 In 1945, another order-in-council approved the flying of the flag over federal buildings within Canada. To many Canadians the Red Ensign was the national flag, and this led to intense feeling when Parliament proposed to replace it with a new design. The beaver, most significant of the fur-bearing animals sought in the fur trade, was identified early as an emblem suitable to represent portions of the vast territories that in the 19th century became Canada. In 1621, King James I granted Nova Scotia to Sir William Alexander. In 1633, when Alexander became Earl of Stirling and Viscount Canada, his new arms featured a beaver to symbolize his fiefdom in the New World. From 1678 the Hudson’s Bay Company (chartered 1670) possessed an armorial seal charged with four beavers and separated into compartments formed by a St George's cross. In 1673, Governor Frontenac proposed arms for Québec City. The arms were not authorized, but the fact that his proposal combined the fleurs-de-lis of royal France with the beaver on the same shield is a clear indication that he viewed the beaver as a major Canadian symbol. In 1690, to commemorate Frontenac's successful defence of the Québec Citadel against the naval attack by Sir William Phips, the Kebeca Liberata (“Québec delivered”) medal was struck. It bore a representation of France as a seated woman and of Canada as a beaver at her feet. A medal entitled “Upper Canada Preserved” was struck during the War of 1812. It shows the British lion protecting the Canadian beaver against the American eagle on the other side of the Niagara River. The use of the beaver as a Canadian emblem declined in the second half of the 19th century, while the maple leaf’s popularity increased. The animal's emblematic importance was revived by Sir Sandford Fleming when he designed Canada's first postage stamp, the 1851 three-penny beaver. Today the beaver, noted for its industry, skill and perseverance, qualities considered suitable for a nation to emulate, decorates the reverse of the Canadian five-cent coin. The beaver was made an emblem of the country by Parliament in 1975. No evidence exists that the maple leaf was viewed as a Canadian emblem before the early 19th century. The first known written mention of the maple as an emblem of Francophone Canadians was within an epigram in a 29 November 1806 issue of Le Canadien addressed to its rival English newspaper, the Mercury. The maple accuses the thorny rose (symbol of England) of maliciously tearing at passers-by. In 1807, or some years before, the Montréal silversmith Robert Cruickshank produced a medal where the central shield of the royal arms of Great Britain is replaced by a single maple leaf, a strong statement that the leaf was also a symbol of Anglophone Canadians. At the 1836 banquet of the St-Jean-Baptiste Society, a speech by the president,Denis-Benjamin Viger, contained a clear statement that the maple tree was the emblem of Francophone Canadians, and the same idea was repeated in a song. The 14 November 1836 issue of Le Canadien declared that the maple leaf was the emblem of Lower Canada; and, during the Rebellion of 1837, both the Lower and Upper Canada Patriots displayed the leaf to express Canadian identity. The maple leaf was officially recognized for the first time as a Canadian symbol in 1859 when the Prince of Wales presented the 100th Regiment (Royal Canadians) with its colours in England. A maple leaf was present at each corner of the regimental flag. The next year the regiment incorporated branches of maple into its badge, and that year the leaves were used extensively in decorations for the Prince of Wales's visit. In 1867 Alexander Muir composed "The Maple Leaf Forever," a song which for decades was regarded as a national hymn. The designs of arms granted to Québec and Ontario in 1868 each incorporated a sprig of three maple leaves. The maple leaf was the badge of the Canadian Expeditionary Force in the First World War. When national armorial bearings were assigned in 1921, a sprig of leaves was an important feature, and in 1965 the maple leaf became the dominant element in the new national flag. In 2011, the Canadian government selected the Maple Leaf tartan to be Canada's national tartan. The tartan design, featuring a distinctive green and red pattern suggesting the shifting hues of autumn leaves, was designed in 1964 by Toronto garment maker David Weiser as part of the lead-up to Canada's centennial celebrations. In a statement issued by Heritage Minister James Moore, "The Maple Leaf Tartan has been worn proudly and enjoyed by Canadians for decades, but has never been elevated to the level of an official symbol – until now. Our national symbols express our identity and define our history. The Maple Leaf Tartan represents the contributions that the more than four million Canadians of Scottish heritage continue to make to our country." Conrad Swan, Canada: Symbols of Sovereignty (1977); Canadian Heritage, Symbols of Canada (2010); Alistair B. Fraser, The Flags of Canada; Auguste Vachon, Les origines du castor et de la feuille d’érable comme emblèmes canadiens and Bannière de France et pavillon blanc en Nouvelle-France. The Maple Leaf Forever? Flag designs that we didn’t pickView rejected designs for a new Canadian flag that were submitted to a 1960’s Canadian government flag committee that are on file at the University of Saskatchewan Archives and Special Collections. From the National Post. Canada’s National Flag Turns 50!A colourful virtual exhibit on the 50th anniversary of the Canadian flag from the Government of Canada (on google.com). Symbols of CanadaAn illustrated guide to national and provincial symbols of Canada, our national anthem, national and provincial holidays, and more. Click on "Historical Flags of Canada" and then "Posters of Historical Flags of Canada" for additional images. From the Canadian Heritage website. FlagsWatch the Heritage Minute about the Canadian flag from Historica Canada. See also related online learning resources. National Flag of Canada DayAn infographic featuring key facts about Canada’s national flag from Public Works and Government Services Canada.